The 5 Step Plan to Buy a Boat to Go Cruising! 1. How to choose and buy the right boat to go cruising. 2. The factors to consider before you shop for the boat. 3. Top 10 interior, exterior, and electronic features you want. 4. The next 10 things you need to do after you buy the boat. 5. How your perspective will change with life aboard. 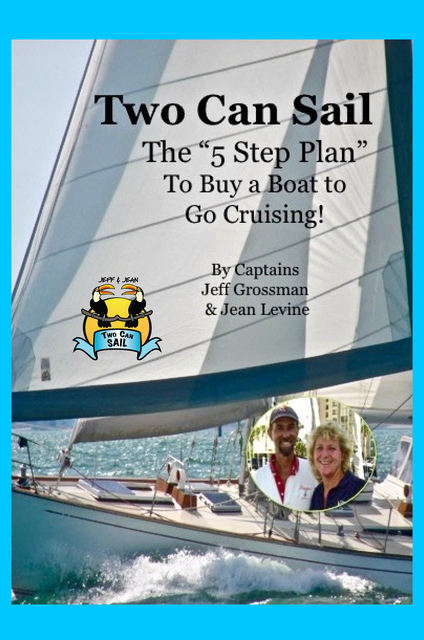 Jeff and Jean assist couples in realizing sailing dreams with their company Two Can Sail. They work with one couple at a time to provide cruising lifestyle consulting, including (but not limited to) buyer's brokers assisting with boat shopping, purchase, surveying and personal training aboard the couple's boat. Jean is a member of the Society of Accredited Marine Surveyors (SAMS) as well as the American Boat & Yacht Council (ABYC). Both Jeff and Jean are 100GT Masters and American Sailing Association (ASA) certified instructors. Together, they have over 60 years experience operating over 200 different models of sailboats, including dozens of cruising catamarans. They have cruised extensively in the Caribbean, the East coast of the U.S. from Maine to Texas, as well as the Yucatan coast of Mexico, specializing in navigating the Gulf Stream. Jeff holds an Electrical Engineering (BSEE) & Computer Engineering degree and has worked with almost all forms of electronic navigation.